Pope from 1012 to 1024. A great persecution of the Jews took place during his pontificate. A terrible earthquake and hurricane visited the city of Rome on Good Friday, 1021, and the following day, in which many persons perished. According to the views of that time, this visitation was considered as a punishment sent by God; and the pope was persuaded, by one who pretended to have discovered the cause of the divine anger, that the Jews had insulted the host while the Christians were paying their adoration to the cross. 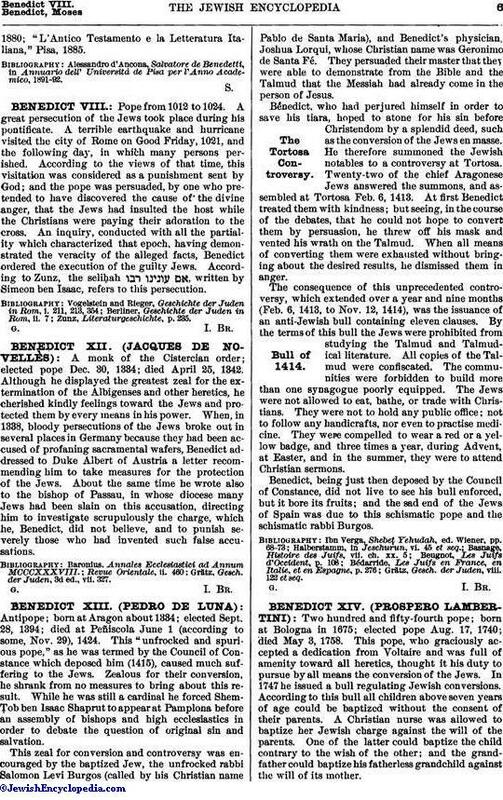 An inquiry, conducted with all the partiality which characterized that epoch, having demonstrated the veracity of the alleged facts, Benedict ordered the execution of the guilty Jews. According to Zunz, the seliḥah , written by Simeon ben Isaac, refers to this persecution.